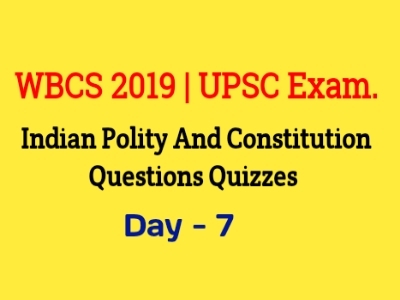 Are you Looking for WBCS 2019, UPSC Civil Service Exam's Indian Polity And Constitution Questions Quizzes? If your answer is yes, then here is the right place for you. 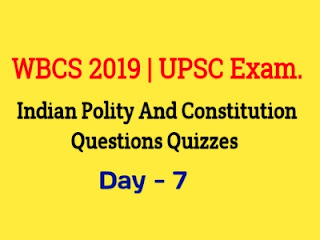 Indian Polity and Constitution Questions Quizzes help you to take better Preparation for UPSC Exam, and Other Civil Service Exam like WBCS 2019. UPSC Indian Polity and Constitution Questions Answers Quizzes Below here. Choose the correct answer below questions and press the 'Grade Me' buttons. Which of the following was adopted from the Maurya dynasty in the emblem of Government of India? Who among the following is known as the Father of the Indian Constitution? When did Mr. Attlee, Prime Minister of England, announce the transfer of power to the Indians? Who proposed the Preamble before the Drafting Committee of the Constitution? .Which of the following is correct regarding the Indian Constitution? The amendment procedure laid down in the Constitution of India is on the pattern of? Who among the following was the Chairman of the Union Constitution Committee of the Constituent Assembly?